Narrative: ELLA JANE ROBBINS DESBRISAY WAS BORN 29 MAY 1847, THE DAUGHTER OF ELLA MURPHY AND WILLIAM M. ROBBINS. ELLA ROBBINS MARRIED ON 5 JANUARY 1877 TO THOMAS D. DESBRISAY (BORN 19 JULY 1844). THEY HAD TWO CHILDREN, WILLIAM AND CHARLES. ELLA DESBRISAY DIED IN 1926 AND IS BURIED IN LUNENBURG HILLCREST CEMETERY ALONG SIDE HER HUSBAND THOMAS WHO DIED IN 1923. 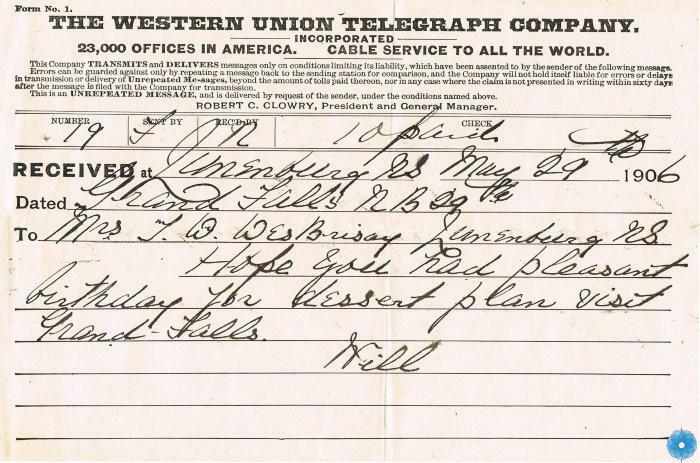 Description: TELEGRAM HANDWRITTEN ON IVORY COLOURED PAPER FROM THE WESTERN UNION TELEGRAPH COMPANY SENT TO LUNENBURG, N.S. FROM GRAND FALLS, NEW BRUNSWICK ADDRESSED TO MRS. T. D. DESBRISAY OF LUNENBURG FROM WILL SENDING BIRTHDAY GREETINGS. History of Use: USED TO SEND A MESSAGE BY TELEGRAPH.